Because our burgers need no introduction! 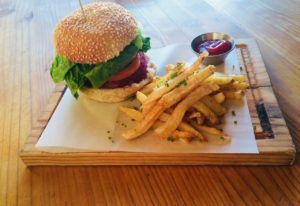 Free range beef, free range chicken, calamari or vegan, they all come accompanied with hand cut triple fried chips. Yes, that's right, R50 only for the plain burger. Add on your personalised toppings to build you own favourite for the night. A fun and casual night out for all, adults, pets (in the Oasis Garden) and kids. Kids can order their own kiddies burger (a half portion) of any type.